CHICAGO (Reuters) - Drug manufacturers have begun amassing enormous troves of human DNA in hopes of significantly shortening the time it takes to identify new drug candidates, a move some say is transforming the development of medicines. The efforts will help researchers identify rare genetic mutations by scanning large databases of volunteers who agree to have their DNA sequenced and to provide access to detailed medical records. It is made possible by the dramatically lower cost of genetic sequencing - it took government-funded scientists $3 billion and 13 years to sequence the first human genome by 2003. 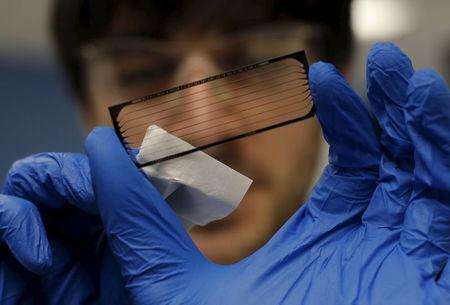 As of last year, the cost was closer to $1,500 per genome, down from $20,000 five years ago. Regeneron Pharmaceuticals Inc, which signed a deal with Pennsylvania’s Geisinger Health System in January 2014 to sequence partial genomes of some 250,000 volunteers, is already claiming discoveries based on the new approach. Company executives told Reuters they have used data from the first 35,000 volunteers to confirm the promise of 250 genes on a list of targets for drugs aimed at common medical conditions, including high levels of cholesterol and triglycerides. Regeneron says it has also identified "several dozen" new gene targets, including a novel gene that plays a role in obesity. Pfizer Inc, Roche Holding AG and Biogen Inc are working on similar projects that use DNA and patient health data to find new drug targets or predict the effects of drugs. Their investments have been inspired by early successes in cancer with drugs such as Pfizer's lung cancer treatment Xalkori, which was approved in 2011 and targets mutations in tumors driving the disease. More recently, Vertex Pharmaceuticals has changed the treatment of cystic fibrosis with Kalydeco, which targets the disease’s underlying genetic cause. "All of a sudden, it all opened up," as companies recognize the potential for drugs targeting genetic glitches, Dr. Eric Topol, a genomics expert at the Scripps Translational Science Institute. "It's starting to really become a new preferred model for drug development." In the past, discovering such genes was a painstaking process, often involving years of research into isolated populations. In 1991, for example, researchers discovered a rare mutation in a gene called Angptl3 that caused very low levels of artery-clogging cholesterol and triglycerides among families in the remote Italian village of Campodimele. It took nearly two more decades and several groups of scientists to fully understand the potential cardiovascular benefits linked to mutations in that gene. Since last autumn, the Regeneron Genetics Center has sequenced the DNA of more than 35,000 Geisinger patients and is on track to sequence 100,000 by year end. Already, the company has identified 100 people carrying similar cholesterol-affecting mutations to those first observed in Campodimele and elsewhere. “You no longer have to find that one rare family in Italy, because it's just in the database," said Dr. George Yancopoulos, chief scientific officer of Regeneron. Identifying target genes is just a first step, though, and does not guarantee that a drug can be developed on a genetic lead, or that it will ultimately be safe and effective enough to be used. Experts also differ on approach. Regeneron is sequencing exomes, the protein-making genes that comprise 1 to 2 percent of the genome, a search that costs roughly $700 per person. Others favor looking at the whole genome, which costs the $1,500 per person. Craig Venter, one of the first scientists to sequence the human genome, believes the whole genome approach will be more meaningful over time. "I'd rather have a gold mine with a deep vein of gold and modern industrial equipment to mine it rather than sitting there with a pan in a stream looking for gold," he said. "Both will find gold. It's a question of how much you find." Even so, the early returns from new "genomic" medicines have attracted attention from the White House. In January, President Barack Obama said he would seek $130 million from Congress to gather genetic data from 1 million volunteers as part of a “precision medicine” initiative. Regeneron is lobbying for the Geisinger database to become a cornerstone of that effort, and proposes creating a consortium of drugmakers to fund it. In return, Yancopoulos said, the company hopes to recoup some of its investment. Dr. Francis Collins, director of the National Institutes of Health, which is in charge of the precision medicine project, identified Regeneron among a short list of potential contributors to the 1 million-strong DNA study. Others on the list include Kaiser Permanente, Mayo Clinic, and the Marshfield Clinic in Wisconsin. A decision is expected by early fall. For drug companies, the lure of a big payoff is strong. Regeneron and its partner Sanofi are expected to soon win regulatory approval for a cholesterol-lowering drug that works by blocking the PCSK9 gene. Amgen and Pfizer have developed similar treatments. Individuals born with non-functioning versions of PCSK9 have very low cholesterol. The new drugs mimic that effect and are considered a poster child for treatments that take advantage of glitches in the genome that prove beneficial to the rare individuals who carry them. Wall Street analysts project Regeneron/Sanofi's PCSK9 drug will generate revenues of $4.4 billion by 2019. Amgen bolstered its search for gene targets by buying Decode Genetics in late 2012 for $415 million, giving it a database of complete genetic sequences of 2,636 Icelanders. The community shares a relatively homogenous genetic profile due to its geographic isolation, allowing researchers to identify gene variations more easily. In March, Amgen reported the discovery of a new mutation that increases the risk of Alzheimer's and confirmed the role of two mutations involved in diabetes and atrial fibrillation. 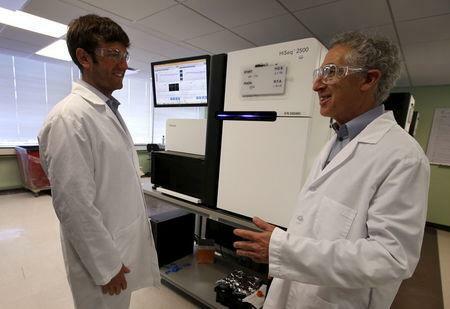 This past January, Roche's Genentech unit tapped Venter's Human Longevity Inc for a large sequencing project. 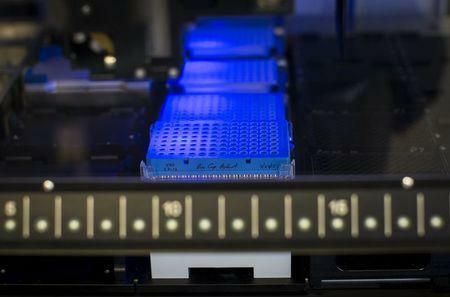 Genetic testing company 23andMe announced deals this year with Genentech and Pfizer. Genentech will have access to 3,000 individuals in 23andMe's community of Parkinson's patients, and Pfizer will expand an existing collaboration with the company to study the genetics of lupus. That same month, Biogen formed a $30 million research alliance to support the formation of a sequencing center at Columbia University. "All of the companies are feeling like, 'Oh my gosh. We have to do something substantial in genomics – yesterday,'" said Dr. David Goldstein, director of Columbia's Institute for Genomic Medicine. At the heart of Regeneron’s model is finding rare mutations that disable normal gene function. So far, it has identified people with at least one such “loss-of-function” gene that correlates with nearly all 250 genes on the company's list of drug targets. That includes essentially every gene previously linked to triglyceride regulation and several novel candidates, Yancopoulos said. They have done the same for cholesterol and coronary artery disease. Regeneron has also partnered with academic centers studying families with extreme genetic disorders, collaborations that already have led to the discovery of a couple of dozen new candidate genes, said Dr. Aris Baras, who runs Regeneron’s genetics center. In one case, they are using the Geisinger database to study a rare gene they believe causes severe obesity in young children. The team has found milder mutations in the overall population that may cause an average 10-pound weight gain in adults. That would validate the role that such genes play in regulating body weight and suggests that, "if you had a drug it could have a profound effect," Yancopoulos said. "This is why everybody is excited about it," he said.